Personal hygiene aside, traveling can be a smelly affair. The taxi smells, the airport smells, the restaurant smells, the airplane smells, and all of that can make you smell. Not the best way to make a good impression or to feel your best while you’re away from home. Sometimes you need a little perfume or cologne to cover up the travel odors. But what’s the best way to travel with your favorite fragrance? There are several options. You can pack your full-size bottles in your checked bags. Several Travelpro models have a wet pocket specifically designed with this in mind. If there’s a spill, you haven’t gotten it all over your clothes and shoes. You can also purchase a smaller size that meets the TSA’s 3.4 ounce requirement, and put it in your 3-1-1 bag. Ask for some complimentary samples when you purchase cologne or perfume at a department store. One traveler we know even created a special compact roll-on version of her favorite cologne out of a roll-on dispenser purchased just for this purpose. It was smaller than 3.4 ounces, and it was enough to last several trips. Duty-free purchases are allowed in your carry-on, regardless of the size, but unless you check your baggage on the return flight, you’ll run into the same dilemma you had before you left home. So if you want to buy fancy airport perfume, do it on your return trip. You might also consider choosing a less expensive option that you designate just for travel. Many retailers offer scented body sprays in travel sizes that could serve this purpose. How do you travel with your favorite scents? Do you have a Bring This Not That topic you’d like us to cover? Let us hear from you in the comments section below, or on our Facebook page. If you’re a smoker and you’re trying to figure out how to travel so that you and your cigarettes arrive at the same destination, here’s the latest from TSA about what smokers can and cannot bring with them. According to the TSA website, you can put two, full standard disposable or Zippo lighters in your checked suitcase, but they must be packaged in DOT approved packaging. The TSA site isn’t specific about what this packaging is, so if you want clarification, call before you fly. Torch and micro-lighters (fancy cigar lighters) are prohibited from checked baggage. In your carry-on luggage, you can bring one disposable or Zippo lighters. One matchbook of safety matches is also allowed. Micro- and torch lighters are not allowed, and neither are single strike-anywhere matches. With the growing popularity of e-cigarettes, TSA has said they can be brought in either checked or carry-on luggage, but the accompanying e-juice must comply to the same regulations as all other carry-on liquids. Just in case you thought otherwise, e-cigarettes may not be used on any flights. Those fumes will set off the bathroom smoke alarms just like regular cigarettes. While we’re not necessarily advocates of smoking, we recognize that people will want to be able to take their smoking materials with them. There was no real explanation as to how many cigars or cigarettes you could bring, but you’ll want to take care not to smash them as you pack your suitcase. Of course, you can always purchase your smoking materials when you arrive at your destination and avoid the problems altogether. Have you run into any problems bringing your smoking materials onto a plane? How did you handle those situations? Leave a comment below or on our Facebook page. When packing for vacations, should you add in your camera or just rely on your phone to take your travel photos? Smartphone cameras have gotten sophisticated and professional enough, that many of us have no idea where our “real cameras” are now, or when we last charged them. However, knowing our vacation is coming up can have us digging through our junk drawers, looking not just for the camera, but also for the charging cord and the instructions. So, should you take your camera with you, or just leave it at home (or give it to your kids as something they can use for their own pictures)? We think that, unless you’re a decent photographer with a good SLR camera, you should skip the little point-and-shoots and just use your phone. The resolution is the same as the compact cameras, it’s one less thing to recharge, and you can upload your photos to your favorite storage site without worrying about downloading. If you have a high-end camera, or are a skilled, serious photographer, take it along. Taking high quality photos may be part of the vacation experience for you. Otherwise why bother lugging a compact camera around and adding it to the ever-growing pile of gadgets that need to be recharged? If you just want to take some photos to remember the trip and to upload to social media, the phone will serve you better in any case. You have a lot of options for storing and sharing photos from a phone that are probably not available on your camera. And with the latest generation of phones, you can even edit photos and videos. You can’t do that on the point-and-shoots. And if you’re in a pinch, don’t forget that your tablet can also take photos. What do you think? Do you take your small cameras along, or do you leave them at home and just use your phones? Leave a comment below or over on our Facebook page. At TravelPro we encourage folks to take “real” vacations where they can truly unplug, disconnect, and fully relax. However, I’ll admit to weeding through my email inbox and taking care of easy emails during the break, just so I’m not buried on my first day back. That can almost take the joy out of time off! But other than that, I don’t take work with me during the time I’m supposed to be enjoying time with my family. I think it’s important that we distance ourselves from work as much as possible. Here’s why you should leave your work at home the next time you take a vacation. A change of scenery can let you refresh yourself mentally. People with stressful jobs may need a break. We think there should be an opportunity to shut off and log out. Studies have shown that taking time off is actually good for you both physically and even professionally. Taking time off can actually help rejuvenate your work life. You come back with a renewed sense of energy and perhaps even a different perspective. Things that seemed like huge problems before your trip no longer seem so daunting. People who seemed extremely annoying no longer make you grit your teeth. And you may find that a true break makes you appreciate your job when you come back because you can almost see it with new eyes. On the other hand, some folks enjoy working while traveling because it gives them the ability to take longer vacations. Or they have a job that allows them to work from anywhere, thus encouraging a lifestyle of more travel and exploration, without needing to be “at work.” In those cases, you can take longer vacations if you take work with you. Even if you plan to work during your vacation, if you’re going to family events, focus on your family and be present rather than investing time in going through work on your phone. It can be seen as rude, especially if you don’t get to see them very often. What are your thoughts on taking work on vacation? Have you? Would you? What are some ways you disconnect from life at home while you’re on a break? Leave us a comment below or stop by our Facebook page and share your thoughts. Do your kids drag their art supplies everywhere they go? Do you head over to Grandma’s house with backpacks overflowing with pencils, pens, markers, scissors, and different types of paper? If so, you’re probably excited that they’re excited and that they’re doing something other than playing video games or looking at a screen. However, you may be less excited at the thought of dragging a mountain of art supplies with you on your next vacation. Think about how much downtime your kids will actually have while on the vacation. If you’re flying to Disney World, their schedules are probably going to be jam packed. If you’re driving to Oklahoma, though, you may want to pack more extensively. Think about how much storage space the supplies are going to take up and how much you actually have. Again, if you’re flying, space will be more limited as opposed to driving, where you and your kid may be able to spread out and bring everything but the kitchen sink. In either case, keep in mind the fact that if you pack too much stuff, your kids are more apt to lose something. If you’re changing hotels or locations, things may get forgotten, so focusing on just a small amount of art supplies can be helpful. Keep an inventory of what they have so you can make sure that certain items don’t get left behind as you travel. It’s also not a bad idea to invest in a “travel only” set of art supplies to use while in transit. And then have a few more things packed away in the luggage to use while at your destination. When you’re on vacation, we at TravelPro always think it’s best to get the most bang for your buck as far as packing space goes. The best option may be to limit your kids to just a pad of paper and one set of pencils. Talk to your kids about nomadic art and the fact that some professional artists carry only a small notebook and a pencil to make sketches on the go. What do you do when your budding artists want to take their entire studio with them? Do you have any go-to supplies or favorite items you have to take? Any tips for parents of new artists? Leave them in our comments or on our Facebook page. Are rolling suitcases the better choice for business travel? Or can a case be made for duffel bags? Is one a business-only choice, while the other is only for weekends and trips to the gym? Let’s take a look at the pros and cons of each bag. Duffel bags can be a handy alternative for the casual traveler who doesn’t want to lug around all the infrastructure associated with a rolling suitcase. 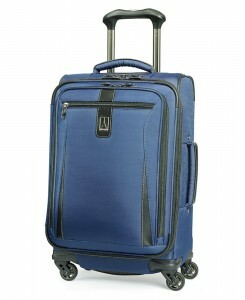 They tend to be lighter and are sometimes easier to maneuver than their upright counterparts in the luggage world. Better yet, some even come with wheels. A big duffel bag on wheels is narrower than a medium or large suitcase and it could even be a little easier to roll around a crowded airport. Despite the general lack of structure with a duffel bag, you might have more organizational options in terms of little pockets throughout: on the exterior, the top, the bottom, and the sides. Some duffels even offer the benefit of a divider panel to separate the bag into two main compartments. 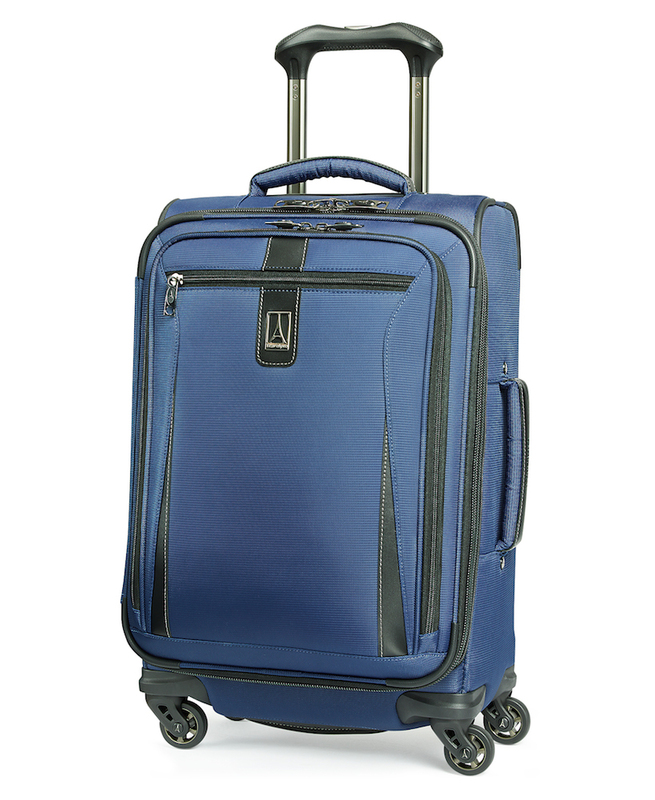 TravelPro offers a drop bottom duffel. There’s a large upper compartment where you put the vast majority of your stuff and then down below there’s another compartment that’s not quite as large. It’s a great area to store things like shoes or oddly-shaped items. If you don’t want to use that bottom compartment, you can also zip out the interior separator and just have one big packing space. That said, a traditional suitcase usually offers small garment sleeves where you can pack your dress clothes. These sleeves can prevent your clothing from getting wrinkled and protect it from shoes. Also, rolling suitcases often offer an expansion feature that duffels don’t always have. TravelPro does offer a duffel with expansion, but your average duffels do not. Some of our rolling suitcase models also have expansion features, if you need to pack some additional items. Bottom line: Duffels can help give a feeling of freedom to your travel experience. A duffel is great for a totally casual trip, especially if you have a lot of shoes or a lot of power cords or odd shaped items. Duffels are great for when traveling with gifts. If you’re doing a more formal trip, or you want to wheel your bag instead of carry it around, you’ll probably want to stick with traditional luggage, and use the rolling suitcase. Which do you prefer? Are you a casual duffel-er or do you prefer the tradition of the suitcase? Leave us a comment and let us hear from you. We’ve talked frequently about the things you should or shouldn’t take the next time you travel, especially on flights. But what are those things you absolutely can’t live without, the items that, if you forgot them, might ruin the entire trip. We talked to several Travelpro employees about those little must-have items that make traveling more bearable and comfortable for them, and the things they always pack first, just to make sure they didn’t forget them. For many people, the answer is electronics. One of the essentials (no surprise) is the smartphone. A smartphone keeps you connected (with talk, text, e-mail and social media), amused (games), and even serves important functions like keeping time and getting you around (maps). Another key item is a laptop computer. Some folks just can’t be separated from their work even for a short little trip. While it’s nice to unplug once in a while, others don’t have that luxury (or personality). 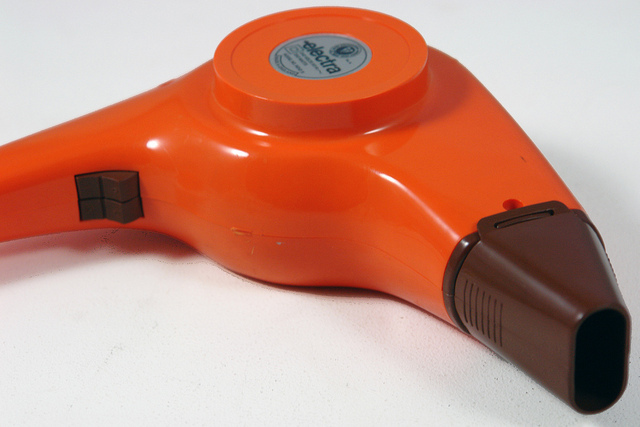 This vintage hair dryer is from the 1970s. A tablet is another new favorite. For those that can’t bear to travel without books, a tablet is a much lighter version that allows you to select new titles while you’re sitting at the airport. You can carry an entire library in a single device, and watch TV or movies on it later. Some tablets can replace the need for bringing a laptop. And many people don’t want to move an inch without a more traditional device, the hairdryer. With all these devices jockeying for space in your luggage, make sure you not only bring their charging cords, but also that you make sure you have the correct adapter if you’re traveling overseas. Quite a number of the Travelpro women said they don’t move an inch without their makeup case. Looking your best on vacation or business is important, as is personal comfort. Several people mentioned neck pillows. Some folks want to make sure they have something comfortable to sleep in, or they bring their favorite t-shirts with them. You can bring exercise clothing along for the ride. Whether you make it to the gym or not, the idea that you’re making your health a priority for your trip can be of great psychological benefit. Finally, when you’re packing for your trip, make sure you have a high quality suitcase! A poor quality bag can ruin your trip or even break open and leak all your favorite items. You need something durable, light, and tough enough to handle the rigors of airline travel. What are your must-have travel items? What do you always take with you, no matter where you’re going? Leave a comment here on the blog or on our Facebook page. Many new parents are often tempted to pack almost the entire bedroom when planning to travel with their kids. They want to make sure they’re prepared for every contingency, every situation. Your kids just don’t need as much stuff as you think they do to survive a flight — you only need the key essentials. There’s often a tendency by new parents to overdo it, because they want to have everything and anything they need. Dragging an enormous diaper bag around the airport, in addition to everything else you have, is just going to exhaust you, and you’ll end up not using most of it anyway. Pack what they need: enough diapers, formula or snacks, one change of clothes, and a small blanket. Everything else you need can be checked in your regular baggage. The other big concern when traveling with small children is keeping them entertained. The very little ones don’t need much at all, maybe a toy and a rattle. Your best hope is that they fall asleep on the flight, so try to arrange your schedule to make that happen. Toddlers generally need more to keep them occupied, so a tablet can come in handy. If you don’t currently have an iPad, Galaxy, or Kindle Fire, we recommend getting one for traveling with children. You’ll get to enjoy it as well, so it’s a win-win situation. Load your tablet with your children’s favorite movies, and some new ones, some games and puzzles, and a few of their favorite tunes. With this setup, you could keep your toddler occupied for the entire trip. If your child has a favorite toy or blanket they’re emotionally attached to, you absolutely must bring it along. Otherwise, the pain of separation will be loud and heart wrenching to you, your child, and everyone seated nearby. If you’re traveling for the holidays, you’ll spend time thinking about what to pack before you head out. Sure, you need your toothbrush and clean clothes, but do you need your pillow, favorite blanket, or other items that make you feel comfortable and remind you of home? If you’re driving and there’s room in the car, take anything that will fit. Just make sure you don’t leave your precious items behind when you return home. But if you’re flying, space is at a premium. You’re going to be packed into a plane with hundreds of other travelers and you may be lugging carry-ons around the airport between flights. And these days, most folks prefer to travel light to avoid paying the hefty fees associated with extra baggage. Plus, you may be carting gifts back and forth, which will already eat into any extra luggage space. One of the great reasons for taking a vacation is to get a break from your routine, and to have new experiences. Can you really get that if you take your whole house with you? In general, no. But if you’ll be staying somewhere for a longer period, like spending several weeks somewhere warm over the winter, you may want to cart a few extras along. Here are a few options to help you save space and energy trying to wrestle everything to and from home. Consider shipping things so you don’t have to carry them with you. This is especially true of light-but-bulky items like pillows. Pack a giant bag, check it, and pay the overage fees so you don’t have to deal with carry-ons. Sure it’s expensive, but you’re not going to get your favorite quilt into your small rollaboard. Buy a carbon copy of the item once you get to your destination. If this is a yearly routine, maybe your relatives will hold onto that comfy blanket. If it’s your second home, it’s easier to have extras. And if you’re just on a long vacation and don’t plan on returning, donate the item to charity before you head back home. Do you take your comforts of home with you? How do you manage it all, or manage going without? Leave a comment on the blog or our Facebook page. Food and the holidays are like salt and pepper. They go together naturally. If your family expects you to make a blueberry pie every Thanksgiving, you probably want to oblige. But should you bake it at home and take it with you, or make it once you get there? It’s an easy question if you live in the same city, but what if you have to travel a long distance for the holidays? If you’re traveling by car, you can make everything ahead of time and put it into a carrying case or cooler. But if you’re flying, you may not want to cart a pie through airport security. Even though TSA’s website says “we’ve seen just about everything,” they also warn that a carry-on pie may be subject to additional screening. In other words, make the food when you get there. The TSA has a list of items you can’t carry onto the plane, including cranberry sauce, gravy, and soup. You could carry them on as long as they measured under 3.4 ounces, but that won’t put much food on the table. You could always check-in the food items in question, but the containers could easily break during the baggage handling process of your flight. Cans or bottles could explode from the pressure, or a glass bottle could break from rough handling from a baggage handler, or when it lands onto the baggage claim carousel from the chute. If you cook with special ingredients or have food allergies or dietary concerns that force you to eat carefully, weigh the pros and cons of packing or carrying these items. Usually your best bet is to buy the food items when you arrive at your destination. Of course, it’s always possible you may be heading somewhere without many options, like a small town in the Midwest. In that case, consider ordering from a specialty food store or even Amazon. Or you could just box the items up and ship them yourself. Either way, your favorite foods and ingredients will be waiting for you when you arrive at your destination. Have you ever shipped, carried, or checked food items for the holidays? How did you do it? Would you do it again or have you found a new method? Leave a comment or let us hear from you on our Facebook page.